The whole reason I put up the coffee shelf was to keep things off of the tiny counter. 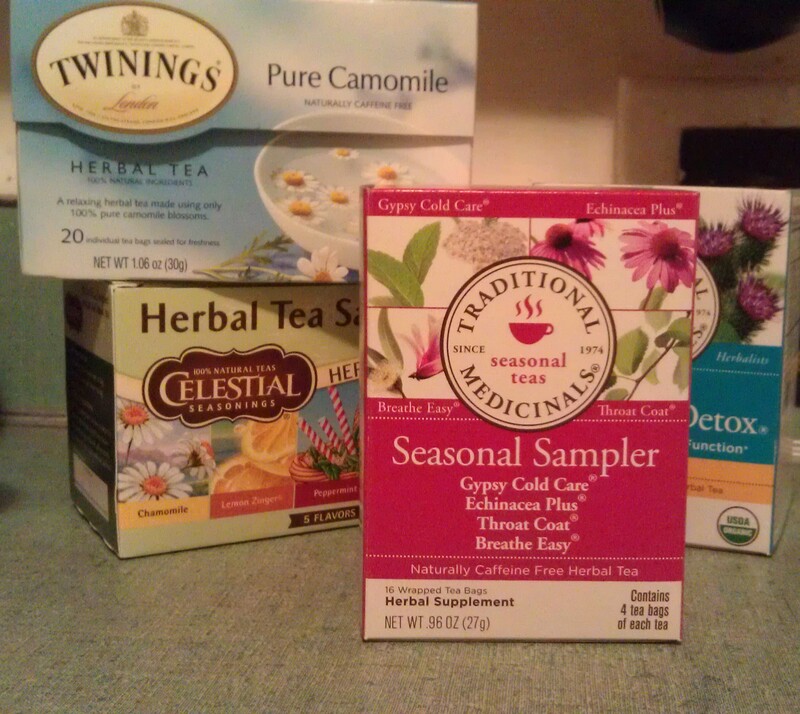 Now I was taking up precious counter space with tea. So I visualized a tea holder in my head. With clothespins to hold the bags, I assumed the little spring in the middle of a clothes pin was the perfect size for a wire coat hanger to fit through so I started hunting. I didn’t want more than one or two coat hangers because I would never use them to hang my clothes, and I am extremely frugal with my crafting. That being said I headed to the local laundromat because I thought that they had a container of free wire hangers, I was wrong. Luckily the laundromat is basically next to my day job, but I really try to stay away from there when I’m not working. I went anyway, because I’m frugal. The uniforms for the kitchen come in once a week or so on wire hangers so there was a whole stash of them in the dry storage closet, and they were the pretty metal ones! I bought a package of 100 clothespins at the dollar store for $1.75 and headed home. My kitchen colors include reds, greens, blacks, yellows and oranges. 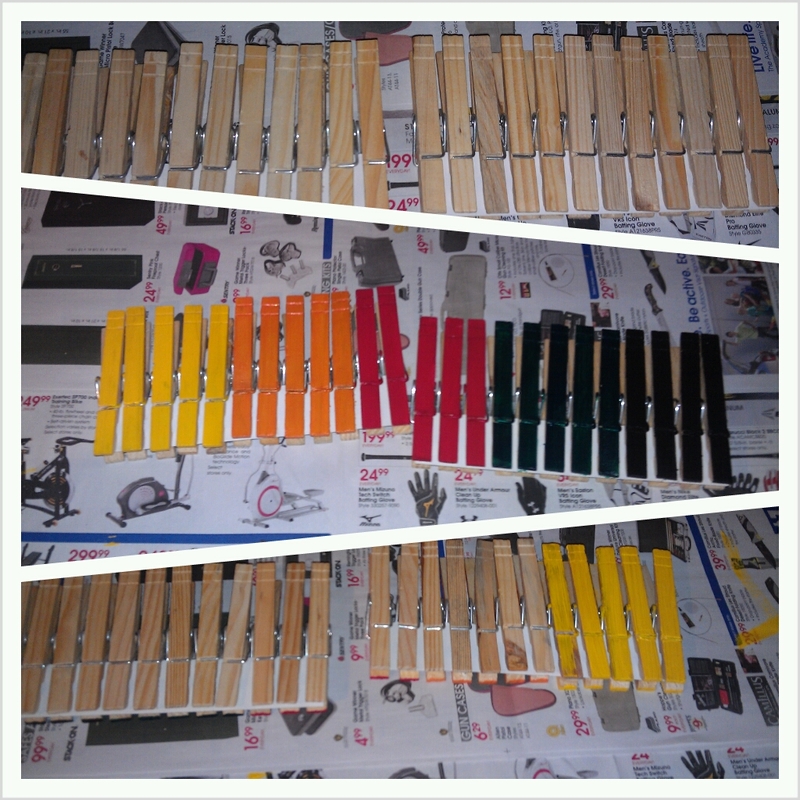 Naturally I decided to paint the clothespins to match. I chose 24 pins and left them on the cardboard that they came attached to because they would be easier to paint without having to hold them. I spread out the ads from last Sunday’s newspaper (that I have really been meaning to read…) and got my paints out of the craft closet. 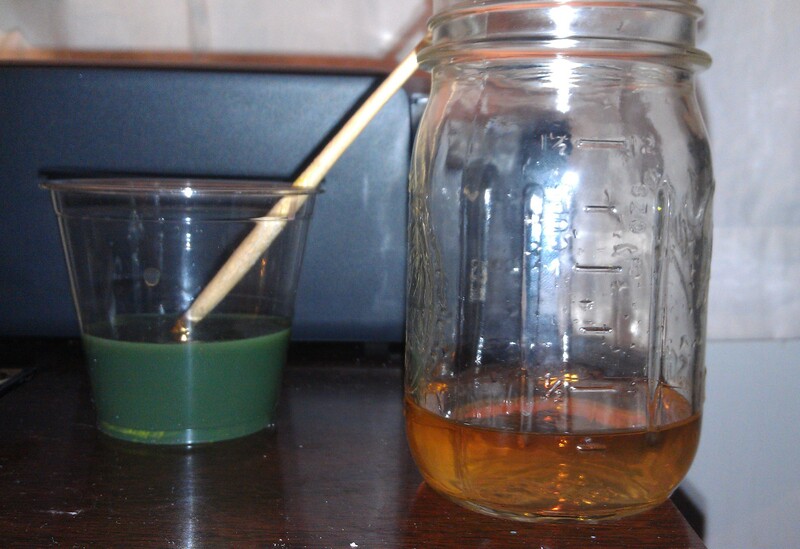 I have to confess, I confused the paint-water and the whiskey one too many times. I never actually drank paint water, but the cup did touch my lips. I painted the clothespins front and back, I contemplated writing words on them but I liked the plain colors when I was through. 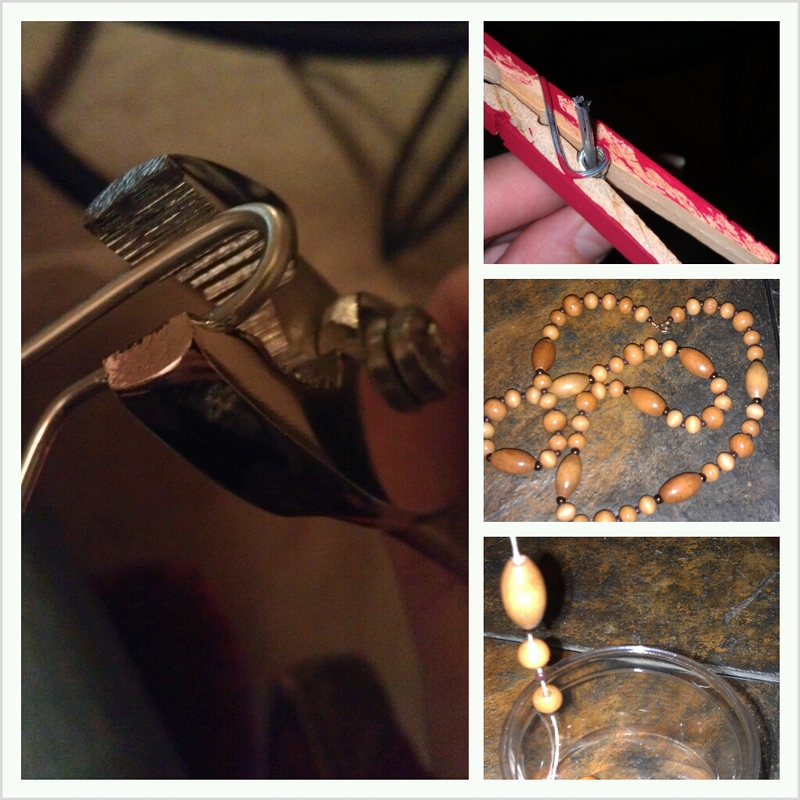 Then I got out the wire hanger and my pliers, I am lucky to have such a variety of tools at my disposal. I straightened out the hanger and cut it about 2 feet long. 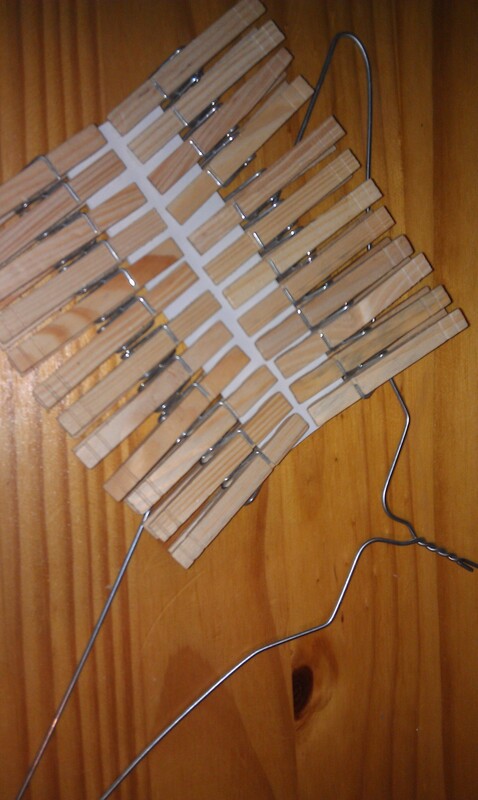 Then I used the pliers to bend a little loop at the end of it to keep the clothespins from sliding off. The clothespins’ springs fit perfectly on the wire hanger, but they were too close together so I got this wooden bead necklace out of my collection. Pretty yes, but I can’t remember the last time that I wore it, so I took it apart. The holes in the beads were big enough for the wire hanger to fit through and my idea really started coming together. I bent a hook into the top of the wire hanger, after I alternated the beads and direction of the clothespins. I got back in my toolbox and found this hanging bracket thing, then I used my drill and a screw to attach it to the kitchen doorway. I hung up, and admired my creation. It’s perfect! Thanks for reading, questions or comments welcome!